Please note that there is a very bad smell that I cannot get rid of. I tried soaking in lemon juice, hydrogen peroxide, baking soda+ water, vinegar, and boiling with lemon juice, vinegar, and baking soda.... The stink is still there. Cup next to its soaking container, a perfectly sized chewing gum box. 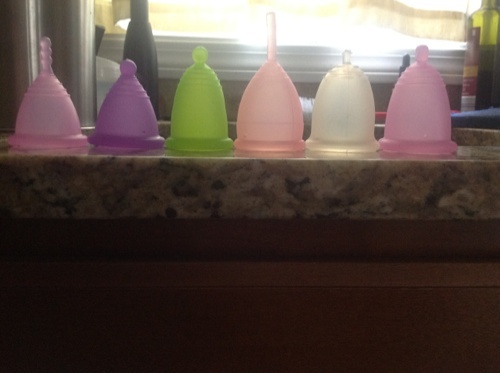 Comparison to Fleurcup S, because out of the ones I have, the Fleur is the closest to it. See how the ridges on the Fleur (clear) are much more pronounced than on the No name (pink)? 1) It is squishy and springy, about as soft as the Fleurcup S, maybe a tiny bit softer, because the walls of the cup are noticeably thinner than the Fleurcup's - the rim is also thinner. 7) lesser quality workmanship - edges not all filed down. Until I get rid of the smell, I won't try it on, so if I get rid of the smell, I'll update this post. Out of the two, I much prefer the feel of the Fleurcup, which I have fallen head over heels in love with after my initial issues I had with it. Left to right: Meluna mini S soft, Meluna mini S classic, Meluna S classic, the Ebay cup, Fleurcup S with stem cut back, Meluna M soft. That looks like an illegal copy of a Lunette small to me. I seriously doubt that cup will be safe to use. I wonder who is making those now, since Green Donna seems to have closed down. I didn't even know it resembled any existing cup. I would send it back, but shipping back to China is more expensive than what I paid for the cup. Sounds to be similar. Do you use yours, and did it have a bad smell? Is the smell unlike that of your other cups when they were new? If so, you might be smelling pthalates. Pthalates have some health risks associated with long-term use for intimate products. I have heard of toys with pthalates described as "smelling like crap." If the smell doesn't go away, there is a chance it could contain pthalates. I'm not saying you definitely shouldn't use it, but I felt the need to pass the info along. None of my other cups had a chemical smell to them: I have Melunas, Fleurcups, and just got my Sibells today. Thank you for the warning - I just know there is too much of a smell. I should have been a bit more specific, all of my cups of different brands have had a "plasticy" smell, I'm not saying that any smell at all means it has pthalates, but if it keeps smelling very strongly or smells differently than the fleur/sibell or melunas that it may. I suppose I'm just suspicious in general of the no-brand cups with no associated companies and thus no assured control over quality. I'd say just give it time, if the smell fades, it's most likely not something in the material itself. Two large clear, or what they call ‘white’ ones, and a small pink one. The large model of this brand is a tidy bit longer than the large Lunette. I got one large from a Brazilian seller ; I think this one was the previous (first?) version of the brand. 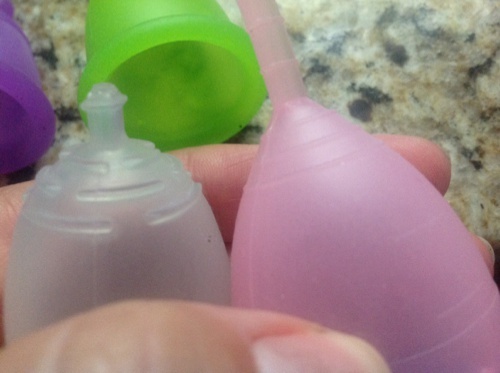 = It has 4 holes, is a -stiff- cup, globally looks like a ‘legitimate’ silicone cup, of a higher quality. The pouch is quite thin, satiny, green, with the brand written in white on it. The other two cups come from a reseller from the French Ebay. In comparison with the ‘older’ (large) GD, here the large only has 2 holes (that are not upon the seams ;) ), is –much- softer, of a slightly different texture, slightly less opaque. 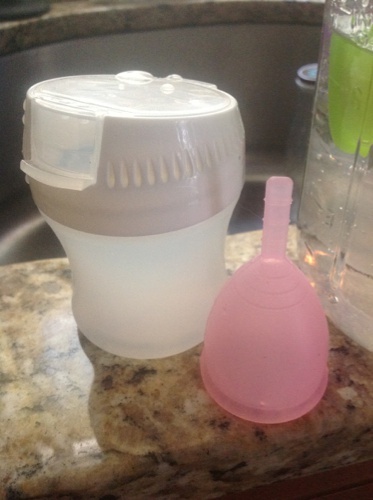 Its silicone (as the one of the small cup) feels more like a gum-like material and texture. The pouch for them is a long one, satiny, pink, with the inside fabric black, and two ‘jewels’ items for the drawstring. On the 3 cups : on the external side (like Lunette! ), right below one of the holes, “Green Donna” is noted, but the inscription is subtle - weakly raised, so to speak lol. Still like Lunette, there are two lines for the measurement of the flow, on the external, below that brand name – these are raised in a super subtle way. On my small pink cup, the brand and lines are almost unnoticeable. One really has to have an acute look at it and/or feel for them with the finger. They do have a smell, but the older large cup has a silicone-like odour, while the other two have a slightly more synthetic(s) smell. And, humm.. the smell is the strongest on my small pink cup (!) Indeed. But I wouldn’t say it’s super strong either, -no-, and not truly chemical nor plastic. After I boiled it, the smell was really weaker, but didn’t disappear. Thus, I tried the three of them, yep ;o), but a very few times only. I wasn’t super impressed, I had a so-so feeling about them ;-). The older large feels rather too firm for me, while I’d describe the newer large as being too soft haha. But I don’t think I had any reverse effect from using them.. eff. Sorry, that was long – trying to be accurate ;o)). Interesting that even some renowned brands have a chemical smell. I guess I really lucked out with my Melunas, Fleurs and Sibells. Maybe chemical smell should go onto the comparison charts as well, then! I certainly wouldn't want to purchase one if I knew about the smell from the get go. The no name cup has the lines you described, but not the GD brand name. It could still be manufactured by the same company, though. Could you post pictures of yours? You’re absolutely right, it could totally be the same company manufacturing the same cup – but having erased the name part on the mould. [Cause, the Green Donna is an illegitimate brand = since it is a copy of the Lunette. Well it’s utterly obvious for the small size = the exact same shape or thickness as the small Lunette. But the large one is just slightly different than the large Lunette. The French Ebay reseller had told me he had a few cups left he had to sell, but that after then, he could not/or there would not be any GD to sell anymore. Then he would sell some Ladycups. If I’m not wrong, now GD isn’t allowed to be sold. The cool MPower cup from South Africa can’t be sold in Europe either, because it was determined as being a Lunette copy, too. And, therefore, what is simpler, in order to be able to keep selling a knock-off cup = remove any name upon the cup (and the box)! As well as the precise type of texture the surface of the cup has. And there has been a topic (or more) about that cup, here on LJ, with a pic on which one could see better the brand on the cup, but I can’t find it back. Sorry. You know, to me the cup feels a bit more plasticky than silicone as well. You may be on to something, here!! I checked out the links you posted: the GD defintely looks different, necause mine does not have the ridge. For some reason, on my iPad, I don't see mauch on the afriska site. It looks like (s)he is building out a shop system? What do you mean, when you talk about the *ridge* of the GD ? Thank you, the link works for me and the pics are awesome! *ridge*: looks like a little shelf on the cup - mine does not have that. Maybe I am using the wrong word? If so, on your cup, it is very thin? Yes, that, but mine does not have one at all - only a line, similar to the measuring lines. .. Oh, does your cup have the exact same dimensions as the small Lunette (about 41mm for the diameter and 47 for the cup length, if my memory is good ha) ? No, it was about 38mm in diameter. I can send the exact dimensions next week when I am back home. If your cup is 38mm in diameter, it should have the exact same diameter as your green Meluna S classic ;o), if you were to compare the two directly. And it seems a brand supplanted this Meluna S, as the world smallest diameter cup, since the Gaia S is 36mm (!) From the instructions sheet I got with my L one. .. I don't know if the MPower company is still planning to offer a different and small size for their cup. But at the time, they were talking of a 37mm diameter cup. .. about the LJ topic, that pic was from aliexpress or alibaba, well from a commercial website in any case. And I remember that at that time the cup was already presented as "Menstrual cup" on the site, not even by its accurate name! I may be lucky, cause the smell on my large Bellacup totally vanished !! Now there’s just a (discreet!) silicone smell. So I can wear it, simply confidently, as I need it (the cup) today ;). 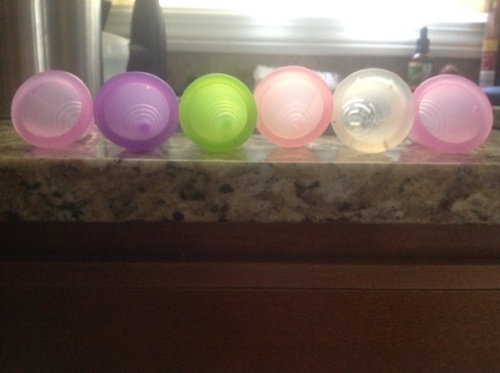 Maybe I’ll have the same good surprise with my 2 Sckooncups..
Good luck with the Sckooncups. If it's related to use, sunlight does a good job getting rid of odor. If it's related to manufacture, that's probably plastic out-gassing and I'm not sure I'd put it inside me. I feel the same way - right now, I would not want to use it. I didn't have too much trouble getting rid of the new plastic smell of my Rainbow Cup. I boiled it for five minutes (I often find that cups smell more plasticky after boiling, while they're still warm), which didn't do much. Soaked it in hydrogen peroxide for a day, sunned for a couple hours, and the smell became pretty faint. It's all but gone now. I seem to remember that the Fleur had a certain plasticky smell when new, too, although it was less strong than the Rainbow. Hope you're having better luck with yours.